They’re back! The lobster party at Spring Restaurant has become a summer tradition, and it’s happening again today through Saturday. Regular lunch and dinner service will be suspended during these last three days before the restaurant closes for summer holiday (August 5-22), and the kitchen will instead be rolling out hundreds of lobster sandwiches. They’ll be served from noon to 8pm on August 2-4, and priced at 26€ a piece, along with goose fat fries for 8€. The vibe will be more casual, but reservations are still advised if you want to be sure and have a place to sit. Book by phone at +33 (0)1 45 96 05 72 or by email at contact@springparis.fr. This year they are from Brittany. They are costlier and different in taste and texture from American lobsters. The flesh is firmer and crunchier (thus trickier to cook right, which — no worry — they perfectly achieve at Spring), and the taste is less sweet. I do think the lobster rolls benefit from these qualities for there is more contrast between the crunchiness of the lobster meat and the spongy texture of the bread. The Source (Daniel Rose) told the Mouth this week that they are from Brittany. I haven’t checked with The Source not The Mouth but in the old venue they were from Maine/Nova Scotia/etc. not France. I tried them years ago (at the old location in the 9th) and they were pretty delicious. As for the price, I totally understand that it’s an expensive sandwich. 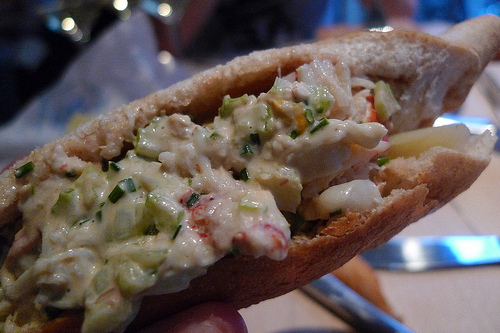 Personally, I don’t find it objectionable considering that it’s Brittany lobster and not chicken salad. It’s also just a chance for me to do something loose and fun at a restaurant that normally costs twice that price. We’ll see on Saturday if it’s worth it! I’m sorry but I’m just so curious I have to ask…for 26€, are they really that amazing?? I tried calling the ‘lobster hotline’ a few times this afternoon with no success, but my email was responded to in about 10 minutes as well. Good luck!! I just checked with Spring and they said that reservations are necessary and they’re not able to do sandwiches to go. However, they still have plenty of space/tables available, so it’s not a big drama to book. My own reservation request by email was confirmed within about ten minutes. I hate to sound ridiculous but can you get these to go? I really don’t know when I can stop by and hate the whole reserving for lunch rigmarole.